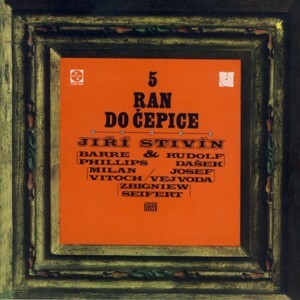 This is a long overdue reissue of the legendary album by the Czech Jazz flautist / saxophonist / composer / bandleader Jiri StivinFind albums by this artist, recorded with an international quintet which included Polish violinist Zbigniew SeifertFind albums by this artist, American (living in Europe) bassist Barre PhillipsFind albums by this artist and Czech guitarist Rudolf DasekFind albums by this artist and drummers Josef VejvodaFind albums by this artist or Milan VitochFind albums by this artist. The original album presented five original compositions, with the title track being a five part suite. All the music was composed by Stivin, except one piece composed by Phillips. This remastered and expanded edition adds four bonus tracks, which originate from an earlier album by Stivin (only side A of an LP), recorded a year earlier and featuring a trio with bassist Petr MarcolFind albums by this artist and drummer Milan Vitoch. All the participants were great pioneers of modern European Jazz and their contribution to the genre is of course invaluable. The fact that such advanced and free spirited music was recorded and released by the Czechoslovak state record label SupraphonFind albums on this label is one of the many miracles that characterize the Jazz scene behind the Iron Curtain and can be understand only by the cognoscenti of that subject. The fact remains that Free Jazz flourished under the Socialist Regime and the albums recorded at the time are some of the best representations of the genre ever created. As usual, kudos to the Polish GADFind albums on this label Records label for bringing this wonderful music back into circulation. Eastern European Jazz connoisseurs will find this album truly amazing and the younger generations are able to test the phrase "nihil sub sole novum" when they approach Free Jazz and Improvised Music recordings. Overall this is a must have for all collectors and fans of East European Jazz recorded behind the Iron Curtain, as well as connoisseurs of Free Jazz, who wish to study the sources of the genre!